Buckeye Valley’s Reilly Taylor, center, outruns a pair of Clear Fork defenders to a loose ball during the first half of Thursday’s MOAC showdown in Delaware. DELAWARE – Sophomore Anika Craft spent a lot of time and effort in the offseason to make herself a better basketball player. 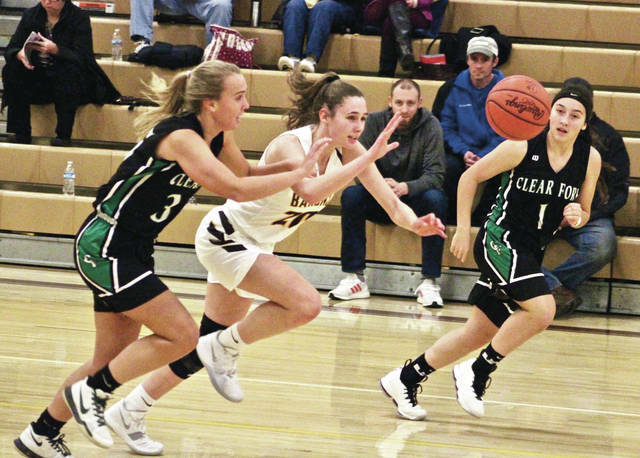 It paid off with a double-double Thursday night to lead Buckeye Valley to a 54-41 win over Clear Fork in MOAC play. “I figure I don’t have a lot of skills, so I make up for it with effort and just going as hard as I can,” she said. She was a fringe player who played junior varsity, dressed for some varsity games and even got into six games last year as a sophomore. Thursday, she was a force around the basket. She scored a game-high 14 points and pulled down 13 rebounds. Craft scored half of her points in the final period to help the Barons put the game out of reach and five of her six field goals came on offensive rebounds and put-backs. Hannah Cowan had 13 points, Chelsea Edington added 10 and Reilly Taylor chipped in nine points for the Barons (3-0, 2-0). Craft’s other field goal was a big one, too. It came in the midst of a 9-0 run to push the BV lead to 34-22 at the start of the second half when she scored underneath off an Edington feed and turned it into a three-point play with a free throw. The Barons held Clear Fork without a field goal in the third until Valerie Golden knocked down a mid-range jumper with 1:24 left in the frame to cut the Colt deficit to 37-26. The Golden basket started a 6-0 run for the Colts. Reagan Marshall followed with a three and Golden knocked down a free throw and Clear Fork trailed 39-30 at the end of the period. The Barons started well in the fourth, too. Craft opened the scoring with a pair of put-backs and Paige Garrett followed with a basket and an assist on a Hannah Cowan basket. Craft followed with another rebound-and-score as the Barons got their lead as high as 49-33. BV took the lead for good on a Cowan three-pointer off a Craft assist with 1:18 left in the first half. Taylor rebounded and scored in the final seconds to give BV a 25-22 lead at the break. Marshall had 12 points and Brooke Robinson added eight to lead the Colts (0-3, 0-3). Next up, BV is back at it Saturday night at Ontario in league action. Tip-off is scheduled for 7:30 p.m.